Midwest Custom Trucks, Cars, Customizing Moberly, Mo. Thank you for letting us make the family members jealous. Boy do those Chrome 20x12 Gear Alloy Big Block Wheels really stand out on your beautiful truck. 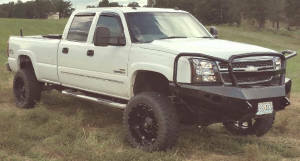 The 6 inch Rough Country Lift Kit and 35x12.50x20 Falken Wild Peak M/T Tires complete the package.